On April 20, 1912, Fenway Park held its first game, a 7-6 nail-biter that saw the Boston Red Sox eek out a victory over the New York Yankees. The park didn’t open to much fanfare, as the Titanic had crashed and sunk only five days earlier, drawing much of the nation’s attention. Prior to the ballpark’s opening, the Boston Red Sox had played their home games at Huntington Avenue Grounds for a decade. By 1911, the team had outgrown that location, prompting team owner John Irving Taylor to purchase a plot of land between Brookline Avenue, Jersey Street, Van Ness Street and Lansdowne Street to build a larger stadium. The stadium cost $650,000 to build, or $16.1 million in today’s dollars, and could seat 35,000 fans. Fenway Park’s official address was 24 Jersey Street until, in 1977, a section of the street was renamed to Yawkey Way, in honor of Tom Yawkey, owner of the Boston Red Sox from 1933 to 1976. The stadium now famously sits at 4 Yawkey Way. The name Fenway Park comes from its location in the Fenway neighborhood of Boston. Like much of city, the area was originally marshland or “fens” that had been filled in to create buildable land. 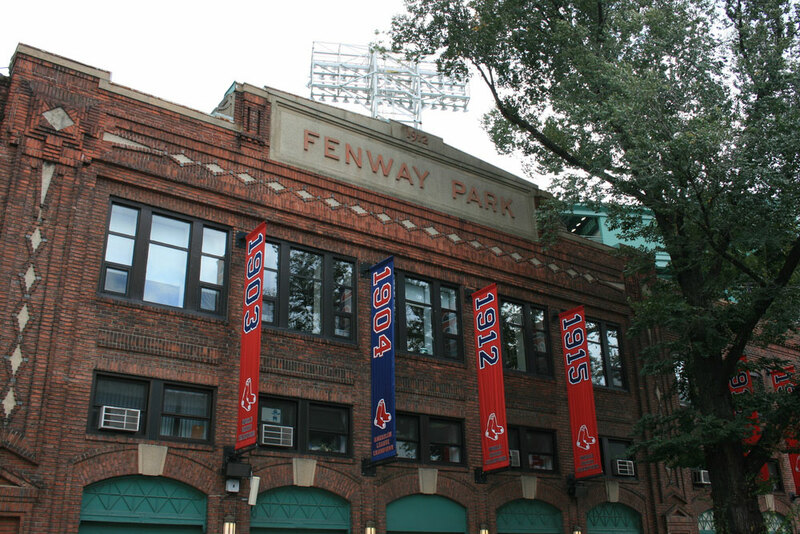 One hundred five years later, Fenway Park is now the oldest operating ballpark in Major League Baseball. In 2003, seating was added to the Green Monster, giving fans a unique viewing experience. Located in the right field bleachers, in Section 42, Row 37, Seat 21, you will find a single stadium seat painted red. This seat marks the location of the longest home run hit at Fenway Park. The homer was cracked by Red Sox legend Ted Williams on June 9, 1946 and is officially measured at 502 feet. An unfortunate spectator sitting in the seat was struck in the head by the ball. Another famous feature is the pole on the right field foul line. At 302 feet from home plate, it is the shortest distance in MLB. Pesky’s Pole is named after Johnny Pesky. The Rex Sox legend hit a number of home runs around the pole. In the spring of 2015, a 5,000 square foot rooftop garden was planted on the third base side of the ballpark, on a previously unused roof. Fenway Gardens grows fresh produce and herbs used in foods prepared and served at the ballpark. Catching a Red Sox game and enjoying a Fenway Frank at this legendary stadium is a great way to spend a summer night. Another way to enjoy America’s most beloved ballpark is by taking a guided tour. You will get a behind-the-scenes look at the park, while your docent shares captivating stories from the Red Sox’s past. You will get to sit atop the Green Monster, sit in the Lone Red Seat, and visit Pesky’s Pole. Visit http://boston.redsox.mlb.com/bos/ballpark/tour.jsp to book your tour.